A stiff knee can develop for a number of reasons. 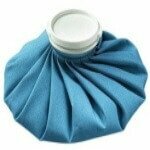 There may be a problem in the joint restricting movement, or weakness in the surrounding muscles. Knee stiffness is often accompanied by pain and swelling. Sometimes there may also be redness, warmth, pins and needles and numbness. There are a number of different causes of knee stiffness but they generally fall into two categories, those caused by an injury and those caused by a medical condition. Here we will start by looking at the three most common causes of a stiff knee, and then we will go on to look at the possible causes of these by first looking at those related to an injury and then those linked to a medical condition. We will then go on to look at the different treatment options for each type. When the knee is damaged, there is often a build-up of excess fluid inside the joint. The amount of swelling will depend on the severity of the injury. With a minor knee injury, irritation inside the joint leads to increased production of synovial fluid. With a more serious knee injury, there may be bleeding directly into the joint, known as a haemarthrosis which can result in considerable swelling. Any excess fluid in the joint can result in a stiff knee as it limits movement by taking up space in the joint. Knee swelling isn’t always visible, you can't always see it - there can be a considerable amount of excess fluid in the joint before there are any outward signs. So it is possible to have a stiff knee without any other symptoms. If one of the structures of the knee is damaged, it can change how the knee moves. There is a sophisticated system of gliding, rolling and spinning movements in the joint to achieve full range of movement. An injury can affect these movements, limiting the mobility at the joint, leading to a stiff knee. Pain can also inhibit movement, leading to a stiff knee. It’s a normal reaction – when we move, it hurts, so we stop the movement. In the early stages following an injury, this response is helpful in preventing further damage. But if allowed to continue, the muscles and joint can become tight which can lead to long-term knee stiffness. Damage to the special cartilage that lines the knee joint. This can cause knee stiffness by preventing the smooth motion of the knee. Sometimes a fragment of damaged cartilage can even get stuck in the joint, restricting movement, known as locking. 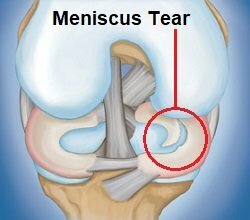 You can find out more about the symptoms, causes, diagnosis and treatment in the meniscus tear section. A mild sprain, overstretching of a ligament, can also cause a stiff knee. This may be in part due to some swelling in the joint but also due to reduced stability in the joint affecting how it moves. You can find out more about the different types of sprains and how they result in stiff knee in the ligament sprain section. 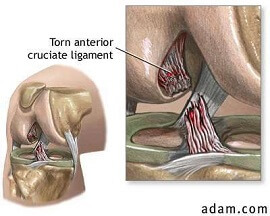 Damage to the ligaments such as the ACL or PCL often causes bleeding into the joint. Swelling usually comes on immediately and is profuse, limiting movement. You can find out more about ligament ruptures, the symptoms, diagnosis and treatment options in the ACL injury and PCL tear sections. A break in any of the knee bones can also cause knee stiffness due to pain, instability and misalignment. The best way to prevent this is to work hard at your rehab programme. This is a rare condition that can develop following an injury or surgery. It is when the body develops excessive scar tissue adhesions which cause painful restriction to movement. Irritation or degeneration of the tendons can affect the pull on the joint, due to weakness and ineffectiveness, limiting its normal motion. 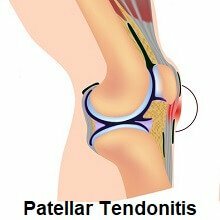 This most commonly affects the patellar tendon at the front of the knee – find out more in the Jumpers Knee section. Not technically an injury, but overworked muscles become tight and weak making the leg feel stiff. Ensure you warm up and cool down effectively to avoid this. 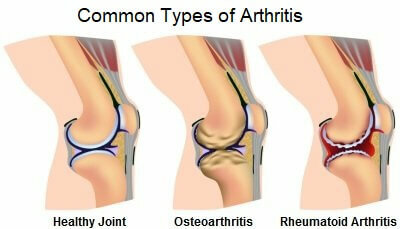 Osteoarthritis is more commonly known as wear-and-tear arthritis and causes the breakdown of cartilage and bone. With osteoarthritis, the joint loses its smooth surfaces and the space between the bones decreases causing knee stiffness. Knee stiffness due to arthritis tends to be worse first thing in the morning or after prolonged rest, easing fairly quickly with movement. It often only affects one or two joints. Rheumatoid Arthritis is a chronic, systemic disorder that causes inflammation and fibrosis of joints. It can result in damage to the cartilage and bones causing knee stiffness (usually in both legs) and is often accompanied by redness, warmth and swelling. Symptoms of rheumatoid arthritis fluctuate, with good spells and bad spells. It tends to affect multiple joints, such as the hands and feet as well as the knees. You can find out loads more about knee arthritis including the causes, symptoms, diagnosis and treatment options in the arthritis section. 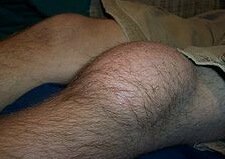 Bursitis is another common cause of knee stiffness and develops when there is swelling in one of the bursa, small fluid filled sacs that provide cushioning between bones and tendons. The bursa get inflamed either from excessive friction or a sudden blow that squashes them. They usually present as a squashy lump, a bit like a small orange, most commonly in front of or behind the knee. You can find out more about the different types of knee bursitis and the best treatment options for each in the bursitis section. This is a type of inflammatory arthritis caused by a build-up of uric acid which deposits crystals, most commonly in the knees or feet. Symptoms come on rapidly over a few hours and as well as knee stiffness, the joint tends to also feel hot, very painful and looks red. Repeat episodes of gout are common. You can find out more in the gout section. There are a few other rare causes of a stiff knee, but they are potentially very serious, and require immediate medical attention. Protect: the joint from further damage, e.g. with a brace. Rest: from aggravating activities, but keep the leg gently moving so it doesn’t seize up. Ice: regular ice treatment can help reduce swelling and therefore knee stiffness. Compression: specially designed bandages such as tubigrip help to support the knee and reduce swelling. Elevation: keeping the leg elevated helps excess fluid in the joint to drain away. You can find out more about each of these in the PRICE treatment section. Stretching, mobility and strengthening exercises for the leg muscles help to improve the flexibility, strength and stability of the knee, which can greatly reduce the symptoms of a stiff knee. Exercises are helpful with virtually all causes of knee stiffness. The quicker you can get the leg moving, the quicker the stiffness is likely to settle down. You can find a whole range of suitable programmes in the knee exercises section. If your leg tends to get stiff after you’ve been sitting for a while, by doing some simple movements whilst resting and before you get up, you can reduce the symptoms. Gently bending the knee backwards and forwards for a minute, or getting up for a quick move around every twenty minutes or so, helps to lubricate the knee and can prevent knee stiffness setting in. It sounds simple but it is really effective. There are various supplements that claim to reduce the symptoms of a stiff knee, particularly with arthritis. The most popular ones include omega-3, glucosamine and chondroitin. You can find out more about how taking supplements can help to reduce knee stiffness and how they work in the supplements section. Any new cases of a stiff knee, especially if the cause is unknown, should always be checked out by your doctor for an accurate diagnosis. The same is true if symptoms fail to settle in a couple of days. In most causes, the earlier treatment begins, the quicker recovery tends to be, so early intervention is key. If none of these are sounding quite like your problem, visit the knee pain diagnosis section for more help working out what might be wrong.